could it be a 5 point map? this map is by far the most balance for the two sides. you rarely find yourself spawn camped if at all. This is the best map. There is one problem with this map. The points with the roofs are on one side of the map. Spawning on the C,D side is an advantage due to orbital strikes. Its nearly impossible to get a good orbital on these points. Other than that the natural barriers and map clutter make for a very tactical map because there are multiple ways to approach each position. The blaster near D has a bit too commanding a position overlooking the supply point on that side. So in the end we won't be getting randomly created maps? Or are the maps made in chunks so they are modular to keep balance working alright? I'm honestly really curious. Only issue I have with this map is having the MCC spawn point and the building spawn points. This is very confusing. I would place the MCCs above the starting building points. This would make spawning more simple, and make the red zone bases make more sense. I made a mock up in photoshop how can I send it you/post it here without breaking NDAs? that supply depot is a death trap for the people attacking from the bottom. i keep trying to get up there without being hit by that turret that has an impressive area of view. and that turret had a strait shot on the console in B. i'm glad they changed the consoles because if the enemy had that turret they could just instanty keep killing anyone that tied to get on B.
it also has a great area of effect unlike the turrets to the south. One question that has bothered me is that the C-D side have three back spawns ( the left and right side of the maps and then from MCC), while the A-B side has only 2 back spawns (the left and the MCC). This is one of the more balanced maps with the exception of this and C-D being better to hold down. I feel C and D are easier to defend most of the time due to the fact that the buildings shelter the objectives from orbital strikes. To balance it out I would suggest moving one of the buildings to the southside. This is one of my fav maps, and I gotta say something... there's a great construction in the north, when I die or I'm selecting my fittings I always take a look at that building, that thing it's huge and it looks like somekind of spaceport or a gigantic hangar bay, it would be awesome having matches there... a future map perhaps? Great card! Left wing, right wing and center. Very easy to navigate on this map. Almost have no options without output situations. It seems to me there is not enough description of the map. Ie what to do in a particular area, these objects. Please put some consideration make this map a Skirmish only. It seems way too big for Ambush, gameplay is always slow, your always constantly searching for kills, your being killed for your wandering. Just a thought. this is by far my favorite skirmish map. but I don't see it very often anymore. the map is well designed and easy to defend all the points, but not like you can't get near them. Like most people, this is my favorite map. There are a lot of strategic points you can take up if you are a sniper, and there are lots of ways in and out of each objective. The north side of the map is easier to defend because you have the cover of the two warehouses and the high ground if you get on top of either warehouse. Furthermore, you have the high ground of the platform in the center of the map if you are able to hold off attackers from A and B. Some suggestions for the map would be to include a third rear spawn for the south side of the map, and possibly giving that side some orbital cover. 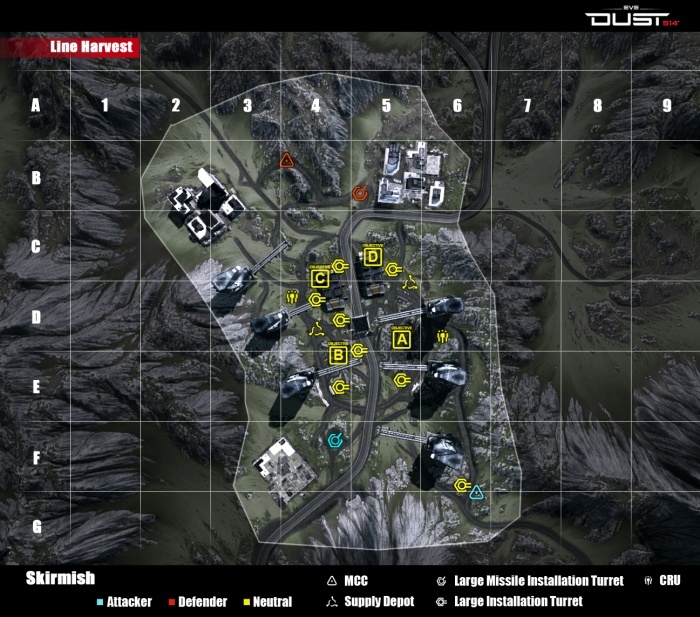 Then again, if a team wants the orbital cover, they need to make a break for one of the north objectives. An easy way to do this, if you are on the south side team, is taking the CRU over by C and using that point to spawn your team in to take that objective. From the North West tower ... walk along to the end of the tubes where they disappear into the ground ... now walk directly towards objective C. Before you cross the road there is a small mound, this is where I got stuck. I got the falling through the map sound effect and could not escape, also exiting the overview map would allow me to use the jump button for a brief time but it would only jitter about and not free me. Hope you find this one and repair it. If spawing in the north and redlined there is little to nothing a team can do. The baster on the north-east side can shoot into much of the ground spawn structure, sometimes killing players before they're fully spawned in (the whole, you're body is there but you can't see/move yet spawn mechanic). While a dropship in the air can pick off those spawning from the MCC before they're able to leave the mountains. I was spawned into a redlined game yesterday in this situation where a Dropship, a tank and that blaster were able to spawn camp both locations 100%. Even as players left the game and other squads were added not once was a single merc able to make it out of the redzone alive (or take proper cover to return fire, or set an uplink elsewhere, etc) much less do anything to put up a fight. Rotating the ground spawn structure so it's opening faces north would fix this problem as it would eliminate all lines of fire into the ground spawn zone and give some possibility of action when spawning in. It might also require shifting the redline to effectively prevent Dropships from camping the spawn mouth. Regardless of the chosen solution the map needs a tweak, it's one thing to spawn camped on an uplink, or to be redlined, it's another to be killed on spawn in before you can act with zero option to adapt. The best map by far nice work CCP. It would add more variety if the overhanging buildings could be seperated and switched with other terrain pieces, such as one being where B is and the other at D.
This Is a great map for Ambush, Skirmish also - not that I play Skirmish that often. It seems to be impossible to hit the Large Railgun Installation South of A with swarm launchers, as the swarms always crash into the mound at its base, even when firing from atop one of the high buildings. There's some really fun structures in the redzones that are open in ambush. Particularly the spots A1 and A5. I would like a variation with some spawn set in those areas. I remember back during the E3 build where all of us were forced to play this map repeatedly (back when it was known as Plateau) and it was full of bugs and issues. Looks like constant abuse of the map has resulted in the most balanced map in the game. Thank you, CCP. This map is perfect for so many professions that my knifing profession also works to its full potential here without having to worry too much about the vehicles. I Find that the map is too cluttered and favorable to certain people, in particular the C D side. There are just a ton of things to hide behind but then random open areas that favor the C/D side because of the amount of things they can hide behind. A/B side does have cover, but again its more cluttered than strategic or useful. Also, A/C side turrets are easily avoided and mostly useless. Previously said by *fill in name here*, the D turret is a little too commanding, but can easily be taken out so i guess that's only fair. Ahh now we have a grid ... the rock I was talking about is in the very bottom left corner of B3. there are many places that shield you from orbital strikes in that map.